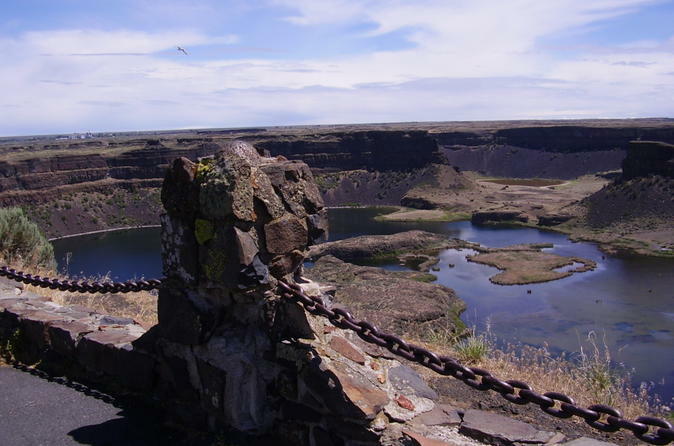 Private overnight tour from Seattle to a geological wonder, Dry Falls. It doesn't sound like much but it's amazing. An ice-age catastrophic flood path and dry waterfall. Day 1 travel across a mountain pass to the Falls, have lunch, and end in Grand Coulee and your hotel. Also, enjoy a laser show with sound commentary at dark. Day 2 after breakfast, visit Grand Coulee Dam, then home. Then, pass through one more magnificent mountain pass on the way home. See fruit trees and stop for seasonal fruit along the way, and also see wheat fields, all a part of our great northwest. On this overnight tour, you'll leave Seattle with a driver guide and cross a mountain pass on your way to Dry Falls, a geological wonder. You'll stop for lunch on the way (included), and then see Soap Lake, where you'll check out the Native American's medicinal waters. It's slimy with minerals! The coulees will leave you in awe. Your guide will share the region's history and heritage on the way to Dry Falls, where you stop and take in the massive flood results - a mini Grand Canyon. You'll arrive in Grand Coulee to check into your room at the Columbia River Inn, rated 4 1/2 stars, before visiting the Grand Coulee Dam Visitors Center. There's time to relax before dinner on your own, then walk across the road to watch the outdoor laser show on the dam, complete with outdoor speakers. There is no night life in this town, unless you want to visit the casino. On Day 2, after breakfast (included) you'll tour the dam, then head across the agricultural lands to a great lunch stop in a Bavarian town, European Oasis. Here, you will have time for lunch on your own. One more beautiful mountain to pass, and then you'll be back in time for dinner. This is a trip of a lifetime.